I believe the first step to recovery is admitting you have a problem; so, hi everyone, my name is Michael, and I have an addiction. Now, don’t get me wrong — this isn’t your typical, run of the mill, consumable addiction, i.e., there is no smoking or drinking involved. This addiction is the kind that wakes you before dawn and leaves you voice-less by dusk. The type, that actually hinges on “everybody else is doing it.” This is the type of addiction, which makes little to no sense, 100 percent of the time. It leaves you broke, fatigued and glory-less. It’s not something you do with those distant cousins at the family reunion when the little ones aren’t around either, and by golly it’s most certainly something I’m not above confessing in church. What I’m trying to say is, I’m addicted to paint. And no, I’m not sniffing it! I just like the way it feels, especially on my skin, from my head to my waistline. If you’ve ever watched a Carolina football game, I’m what some would refer to as 1.) those crazy kids 2.) wow (note the slight condescending tone) 3.) stupid, whatever it is, I’m one of those kids who finds the most pleasure in Carolina’s athletic scene, by being the absolute, best fan I can be. I’m talking, painting at least three hours before the game, waiting at the gate for two hours before it opens, and not leaving until after the ENTIRE team has left the field, even in 27-degree weather (UNC vs. Dook, Nov. 24, 2007). I’m talking hours of prep for the ability to have a sore throat, heat exhaustion and slight dehydration. I’ve been doing this since Sept. 15, 2007, when the Tar Heels took on the Virginia Cavaliers. Now, I would be slow to say my… let’s call it a relationship, with paint was anything like love at first sight. As a matter of fact, that first football game, I only painted my face. 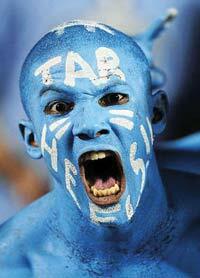 There were some senior guys on my hall who were, at the time, the best fans at Carolina. These were guys who would go to an athletic event because they knew there wouldn’t be a crowd if they didn’t. I’m talking die hards at everything. They decided they were painting up for the UVA game and were asking who wanted to paint. At first I wasn’t going to, I was extremely skeptical. I just couldn’t wrap my mind around my body being covered in something that belongs on a canvas. This was when Chris turned to me and said: “Paint up, freshman, everyone else is doing it.” So, with a little help from peer pressure and my own personal crazed thoughts, I did, but with the caveat of only painting my face, because I was “having small coughing fits” (that might have been a lie). We got painted and then ran down to Kenan (from Joyner, where we lived), through Student Stores screaming all sorts of Tar Heel chants. The crowd was losing it! Every UVA fan we met on the path to Kenan just stood in awe, our intimidating presence alone seething into their souls alluding to them the thrashing they were about to take. I’ve never had more random strangers walk up to me and ask to take my picture, until then. I think the guys and I had at least a dozen random photos taken of us. We were celebrities, and we weren’t even on the field. I once was interviewed, briefly, by The News and Observer, during the 2008 Homecoming game (UNC vs. Georgia Tech, Nov. 8, 2008) because my, at the time, 11-year-old brother painted up with me when he came to visit. I specifically remember being asked a question about why I painted up for the games like I did and I said, “I want to be an integral part of what’s going on the field, some people come to watch the game, I come to be a part of the game.” The funniest thing is, when that game was over and I finally got to wash my face off, I longed, I yearned, I practically lusted for another opportunity to turn it blue, paint up style. Michael A. Betts II ’11, of Greensboro, majored in communications studies, with a media productions focus. He plans to pursue a career in media production for a year before returning to graduate school for a master’s in acoustic engineering.